FEMA retracts for 8-20kg gliders, scale 1:2.5 - 3.2, fitted with a 127mm dia. solid rubber wheel and wheel brace. See combo package content bottom of page. »FEMA retractable undercarriages are designed without any technical frills, but 100% functional and stable." This statement is FEMA also remains the commitment to the further development. The new generation of FEMA retracts for large gliders is a further development of the proven Retracts, FEMA manufactures since 1988. Reliable operation. Both end positions locked. Highly effective wheel brake (optionally available) for the security for the model and the environment. Spring-loaded mounting (optionally available) for soft landings. Robust mounting in the fuselage in two plywood bulkheads. Installation height in the fuselage widely variable. The spring steel wheel brace ensures a safe function of the retract doors. A detailed installation manual simplifies installation. With these retracts, sets FEMA new standards in terms of quality, modularity and price. The Retractable are designed modular and can therefore be optimally adapted to all conditions of use. The retracts can be optionally fitted tightly between two bulkheads or suspended with shock absorber. In conjunction with the solid rubber wheels from FEMA, this Retracts withstand extreme loads. Spring force (N) = model weight in kg x 40 (1kg ~ -t10N). There are gas springs with spring forces of 200N, 300N, 400N available. For models over 10kg weight 2 gas springs must be installed (over 20kg 3 pcs). For the safety of your model and the environment, we recommend the installation of a wheel brake, regardless of whether you are installing the retract fixed or sprung. 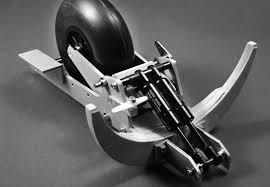 The wheel brake is operated by a servo and can, despite the high braking force, used very sensitively. 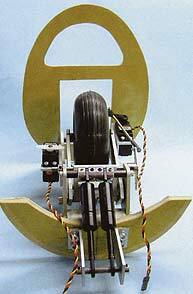 When rigid mounting the retract the brake servo can be mounted on the front bulkhead or directly on the retract frame. When spring-loaded, the brake servo has to be mounted onto the retract frame, so that during compression of the wheel brake works safely. If the brake servo attached to the retract frame, a bellcrank P/N 9890/22 is required. 9864 Assembled landing gear with FEMA wheel 127mm dia and bow.